1 JOHN 4:7 KJV "Beloved, let us love one another: for love is of God; and every one that loveth is born of God, and knoweth God." 4Ye are of God, little children, and have overcome them: because greater is he that is in you, than he that is in the world. 5They are of the world: therefore speak they of the world, and the world heareth them. 6We are of God: he that knoweth God heareth us; he that is not of God heareth not us. Hereby know we the spirit of truth, and the spirit of error. 7Beloved, let us love one another: for love is of God; and every one that loveth is born of God, and knoweth God. 8He that loveth not knoweth not God; for God is love. 9In this was manifested the love of God toward us, because that God sent his only begotten Son into the world, that we might live through him. 10Herein is love, not that we loved God, but that he loved us, and sent his Son to be the propitiation for our sins. Beloued, let vs loue one another; for loue is of God: and euery one that loueth, is borne of God and knoweth God. Beloved, let us love one another: for love is of God; and every one that loveth is begotten of God, and knoweth God. My loved ones, let us have love for one another: because love is of God, and everyone who has love is a child of God and has knowledge of God. 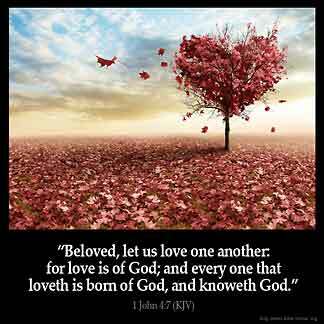 Beloved, let us love one another: for love is from God; and every one that loveth is born of God, and knoweth God. Beloved, let us love one another, for love is of God; and everyone who loves is born of God, and knows God. Moost dere britheren, loue we togidere, for charite is of God; and ech that loueth his brother, is borun of God, and knowith God. 4:7 Let us love one another - From the doctrine he has just been defending he draws this exhortation. It is by the Spirit that the love of God is shed abroad in our hearts. Every one that truly loveth God and his neighbour is born of God. 1Jo 4:7 Let us love one another. He that is born of God must love because the Father is love; hence love shows that we are of him and know him. When I was away from the Lord I didn 't want nothing to do with what I called then Christians . I was not of God then. Now that I am born again I enjoy being around Christians because I am a Christian like them. If I don 't like being around my own kind I am not born of God And that will not be !!!!! Praise God !!! !